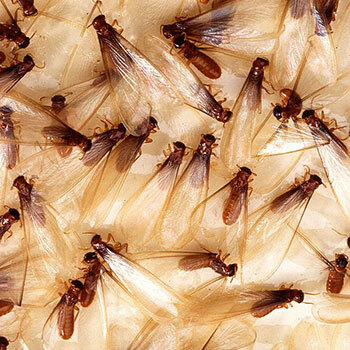 Subterranean Termite Swarmer | Massey Services, Inc.
(Length: 1/2″) These dark brown to black winged insects are the male and female reproductives. They emerge from the colony in a dark cloud at least once per year. Their short flight drops them to the ground where they then seek the proper conditions for the king and queen to start a small brood chamber in the soil. The swarmers are often confused with winged ants. The major visible differences are the waist (pinched in the ant, broad in the termite), the antenna (elbowed in the ant, straight in the termite) and the wings (two different sizes in the ant, all the same size in the termite).